22/10/2015 New image of Tuttle Hill windmill added. 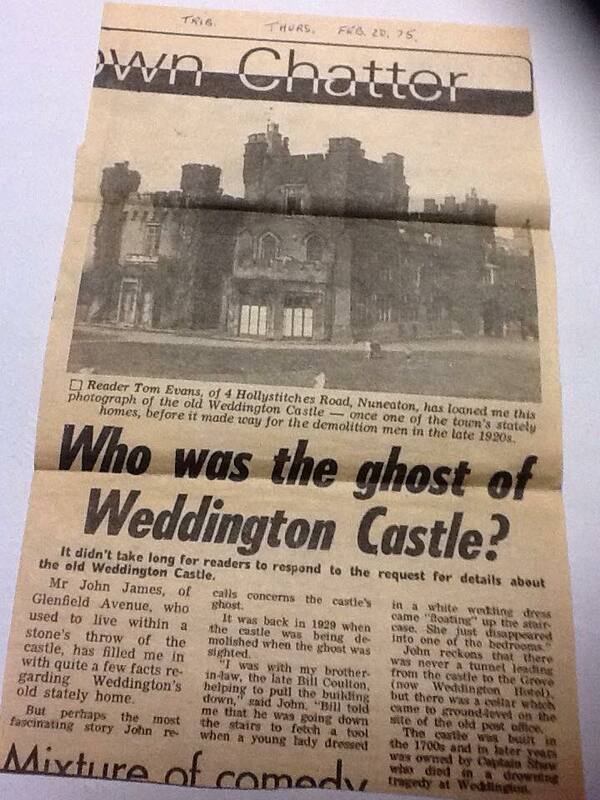 24/09/2015 Article on ghostly sighting at Weddington Castle in 1929 from Nuneaton Tribune in 1975 added, courtesy of June Miller. 21/09/2015 5 images of Weddington Church Fields (c) Mark Palmer, added to Picture Gallery. 20/09/2015 Link to 'The ﻿Twelfth Face of Ruth's Destiny' ﻿- a fictional novel by local historian and geologist Alan F Cook set in Weddington added to Miscellanea section. 19/09/2015 Link to 'The Sword, the Snake and the Curse at Pyreway Field' - a fictional novel by local historian and geologist Alan F Cook set in Weddington added to Miscellanea section. 18/09/2015 Video of Astley Castle: 'A Winter's Tale' added. Article on woman arrested for fortune telling in Weddington added to Miscellanea section. 11/04/2015 Image of workers at Tuttle Hill Windmill added along with additional information. 31/01/2015 Nuneaton Council have confirmed that our suggestions for street names on the new housing development to reflect the area's heritage. Read more here. 27/01/2015 Four new items added to Castle Shop - 2 hot water bottle designs, a Peruvian hat and a 'Weddington Castle Kitchen Staff' apron! 06/01/2015 Updated history of Sergeant Sydney John Vine, Groom to Captain Charles Shawe added to Victorian Servants section. 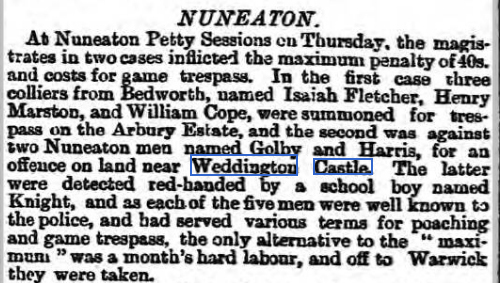 03/01/2015 Article from 1903 on the Atherstone fox hunt added (regularly attended and hosted by the Shawes of Weddington Castle). Column 5, half way down. Image of Hartshill Castle from the turn of the century added. Updated info on Attleborough Airfield added.